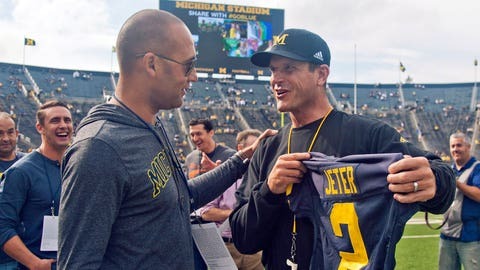 Derek Jeter made an appearance at Michigan Stadium earlier this season. Michigan football will be part of a new all-access series also featuring the men’s basketball team and softball team during the 150th year of Wolverine athletics. It will be produced by The Players’ Tribune, a digital media platform founded by former New York Yankees great and Michigan native Derek Jeter. “I first fell in love with the University of Michigan on my recruiting trip and then again while I was attending classes there. My heart has been there ever since,” Jeter said in a news release from Michigan. “Alongside other sports fans, I’m looking forward to getting to know these teams and these athletes." Per the announcement, fans will receive an exclusive behind-the-scenes look at the football, men’s basketball and softball teams that will include stories written by athletes and alumni, photo diaries and video documentaries. The Players’ Tribune will have behind-the-scenes access to practices and on game days while also following the teams when they go on the road. Interim Michigan director of athletics Jim Hackett called TPT "an ideal platform" for the programs to use to share the experience of being a student-athlete. Jeter never suited up for the Maize and Blue baseball team, but he signed a letter-of-intent before opting to join the Yankees organization. The series is set to begin later this month and continue throughout each team’s season.